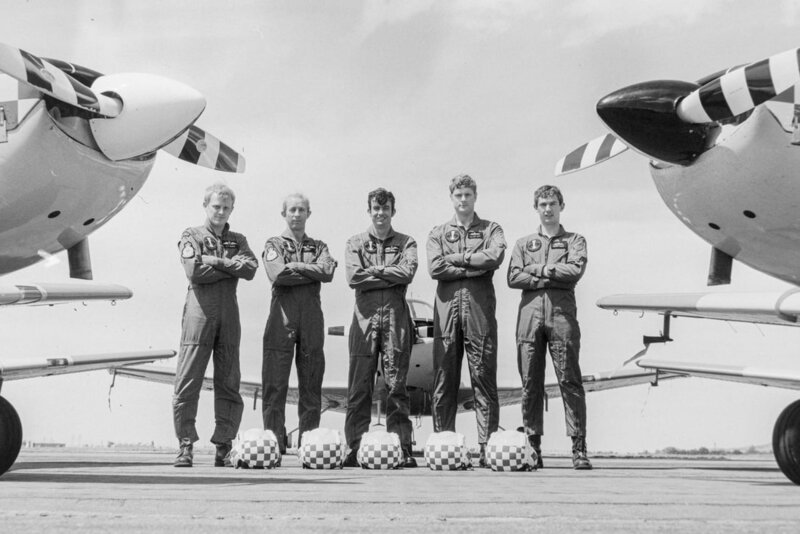 The Red Checkers, in the early 1980's: Colin Pearce, Steve Bone, Bruce Ferguson, Malcolm Knox and Roger Read. 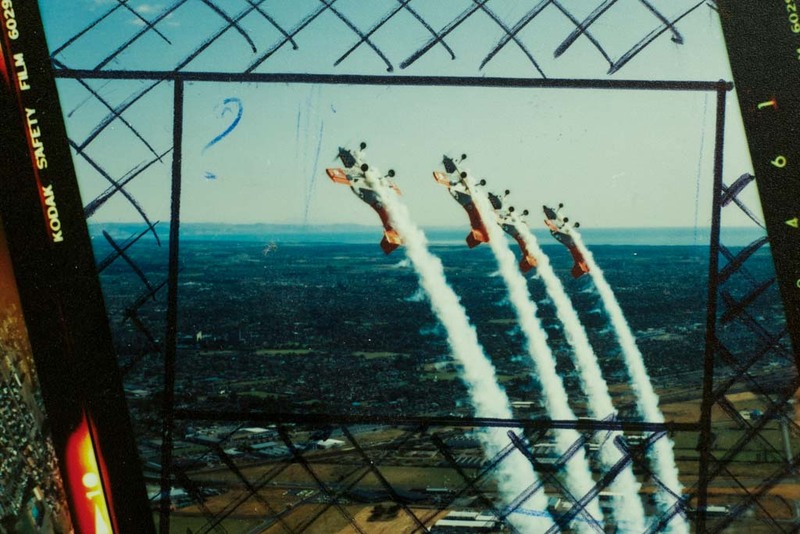 A rather “exciting” task I was involved with was photography of the aerobatic team for the Air Force. Aerobatics (from the aerobatic aircraft), for those of you that have never experienced the process, is a bit like a really, really smooth roller coaster ride, with gravitational forces so intense that your blood vacates the brain and you may pass out during positive G manoeuvres. Negative G is a rather unsettling feeling often resulting in burst blood vessels in the eyeballs. There was none of that on the flights I have done but I have seen pilots return to base with bloodshot eyes. 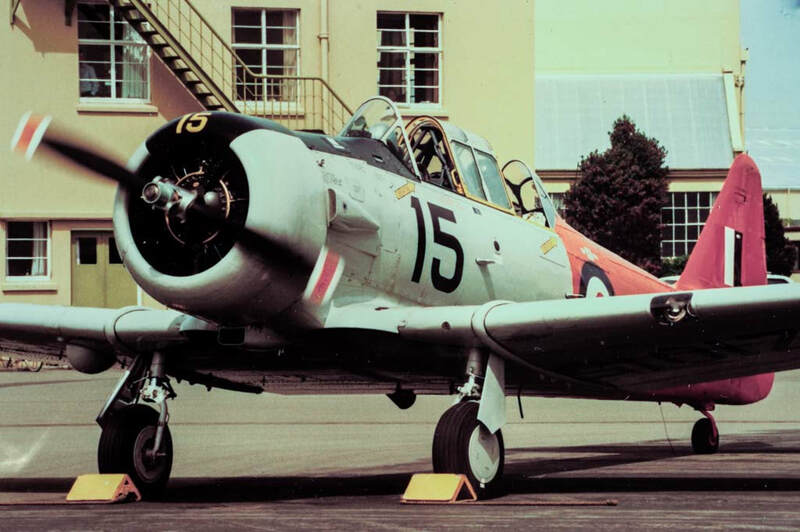 The first time I flew with the Red Checkers was in a Harvard (a WW2 pilot training aircraft which was one of the original Red Checkers aircraft). As we started to taxi towards the runway, the pilot was going through his checklist and making sure I was all sorted. We left the ground after a prolonged roar from the Harvard’s huge 13 cylinder radial engine with the five CT- 4 Air Trainers climbing into the air in front of us. Wheels up, now we just needed to fall-in behind the Air Force aerobatic team. We did this repositioning and I slid the canopy back and locked it fully open, as planned. Now we were ready for the fun to start! The well-practiced routine began but as the G-force increased I struggled to keep my head up because of the weight of the helmet, the camera became "dead weight" on my lap and I puffed and panted due to physical stress, until I eventually passed out! This occurred a number of times - but only at the bottom of a loop. The G force loosened a wee bolt in the winding mechanism of my Pentax 6x7 camera (10 shots per roll of film) which failed half way through the routine, so I said to the pilot that we might as well return to base. We finished the flight, landed and I went back to the Photo Section with my broken camera. My pilot on the next occasion explained that the best way to combat blood loss to the brain was to prevent he blood from traveling directly to your lower body. One way to do this is to imagine you are suffering from constipation and try to “force it out” by pushing from your solar plexus region - really hard! This eases the gravitational effect of blood flow away from your brain and traps some of that much needed blood in your upper body. He said “You can grunt away as much as you like, no one is going to hear you!” So I put on the parachute (like a huge seat cushion), climbed into the backseat of the Harvard, strapped in and started to ease into my helmet and headset. One of the ground crew handed me my camera, a twin lens reflex Mamiya C330 this time (fewer moving parts that can fail). Everything was going well as we climbed to the desired altitude with the aerobatic aircraft directly in front of us. Then the Air Trainers all disappeared for my view (they had started their dive together) shortly after that all I could see was the patchwork quilt of the ground and the Harvard went really quiet (powered off) - we were diving toward the ground! Suddenly five thick smoke trails stretched out, rocketing vertically across our boughs. A second later, under crushing G-forces (well, it seems that way when you are holding something with a bit of weight), the patchwork quilt was exchanged for sky, with a brief look at the horizon. Back to deafening full throttle for the “up hill” slog. A "proof" of one of the 6x6cm sample images. While going through the bottom of the loop (pulling up) I did what the pilot advised and grunted my way through the gravitational force that pushed me deep into my seat. My helmet felt so heavy that I struggled to keep my head up. My arms were like lead, but I took a breath and kept grunting, until the force eased and we began to climb again - vertically. We were now pointing straight up with only sky to be seen. (even though no one could see me)! The pilot had been a party to all of my grunting because I had missed turning the intercom switch OFF! I could hear a horn blasting periodically, later discovering that this was the warning to the pilot that the wheels were up and power was minimal - so that you didn’t land with your wheels up (remember this is a WW2 aircraft). I asked the pilot to move the aircraft off to one side of the aerobatic team, so that I could get a better shot of the display team “Roger that”, as he realigned us, “how’s this?”. “Great” I said as we approached the top of the loop. Now comes the scary bit (for me anyway). The best position for doing shots of the team was going to be from their front three quarters area, so that we were slightly in front of them - off to one side. This required some major twisting in the seat, so with this in mind, I had loosened my shoulder harnesses so that I could shoot back towards the five aircraft - BIG mistake. As we inverted and the positive G's receded I "fell" into my shoulder straps, I dug my heels into the space below the seat pan as the slack in my harness was taken up. Basically I felt that I was "on-my-way-out" of the aircraft for a second, until I could feel the shoulder straps cut into my shoulders again - remember my canopy was open, nothing between me and the ground as we hung upside down! Settling for shots from the side rear view was a safer approach, so I squeezed off a shot or two of the subjects, after all that is why I was there. 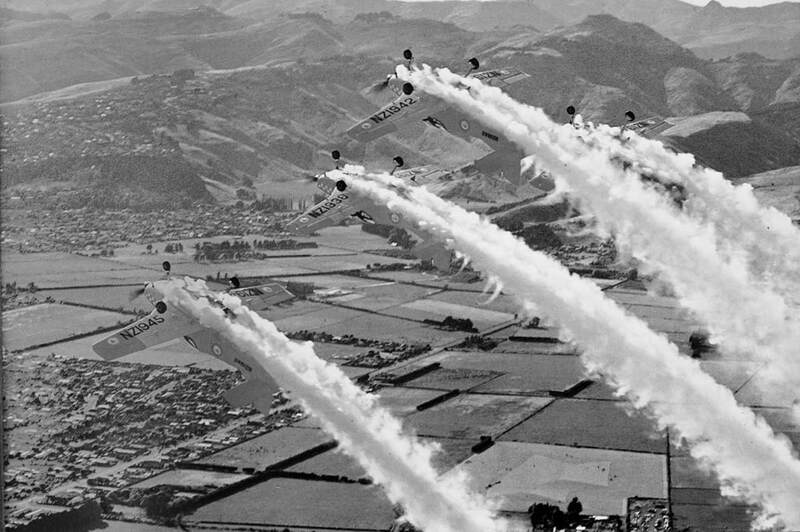 My job was to photograph the aerobatic team going through their paces over the historic airfield for an Air Force publicity poster. We went through this entire routine a couple of times so there was less anxiety after that. There were 12 shots on a roll of 120 when using a square format camera like the Mamiya C330. I did not need to reload while we were airborne, which was a great relief to me because when you I take my eyes off the horizon to do something like putting in a new roll of film the G forces can make me feel really airsick. Once back on the ground and I could get my "jelly like" legs to operate normally again - it was time to get the colour film processed for producing the poster - Job done! The finished product was in colour, but I was unable to get a copy of the full version - here it is anyway.